Dermatological. Perfume free. White Soft Paraffin Light Liquid Paraffin Anhydrous Lanolin (Medilan®) Treatment for Dry Skin conditions including: Dry/ flaky skin Eczema Itchy skin Dry psoriasis Sunburn What E45 Cream is used for: E45 cream has been clinically proven to treat and soothe dry, itching, flaking, chapped, rough and calloused skin, sunburn and detergent hands. Non greasy formula leaves skin soft & relieved. 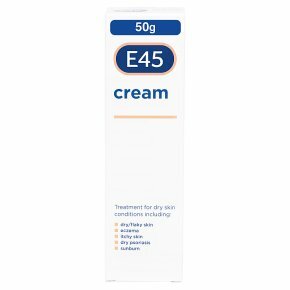 E45 cream is also for more serious dry skin conditions such as eczema, dermatitis, ichthyosis and certain dry cases of psoriasis. Before you Use E45 Cream: E45 cream can be used everyday by the whole family, including infants over the age of 1 month. Do not use if allergic to any of the ingredients. Use this medicine only on your skin. Check that the tube seal is intact before first use, then remove it. How to Use E45 Cream: Apply to the affected skin 2 or 3 times daily. If symptoms persist, consult your doctor. E45 cream contains: Cetyl alcohol which may cause local skin reactions (e.g. contact dermatitis). E216 and E218 which may cause allergic reactions (possibly delayed). Regularly change your clothing, bedding or dressing when using large quantities (>100g) of this product, and keep away from naked flames. Speak to your doctor if you are using minoxidil. Not recommended during breastfeeding.<br><br>POSSIBLE SIDE EFFECTS: Occasionally, allergic reaction or worsening acne may occur. If you suspect an allergic reaction such as a rash, or if anything unusual happens, stop using the product. If you get any side effects, talk to your doctor, pharmacist or nurse. This includes any possible side effects not listed above. You can also report side effects directly via the Yellow Card Scheme at: "http://www.mhra.gov.uk/yellowcard". By reporting side effects, you can help provide more information on the safety of this medicine.<br><br>KEEP OUT OF THE SIGHT AND REACH OF CHILDREN.